How do we support the mental well-being of the people who are on the front lines? Our first responders. These jobs where people put their lives at risk to help others but aren't supported enough in taking care of themselves? 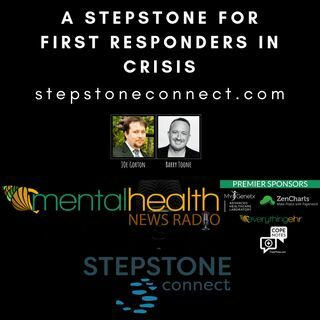 Join two of the founders of Stepstone Connect, Joe Gorton and Barry Toone, with our host Kristin Sunanta Walker, as they discuss how they serve our front line support. Joe Gorton is the CEO/Co-Owner with Step Stone Connect. Offering therapeutic and consulting ... Más informaciones services. He is an empathic, effective, and motivated professional; Experienced with a broad range of mental and behavioral disorders; Clear awareness of diverse backgrounds; Proven experience of growing the client base and implementing strategic program development; Consummate net-worker with exceptional communication skills; Licensed as a Certified Mental Health Counselor. Mr. Barry Toone is General Counsel and Co-Founder of Stepstone Connect, a Telebehavioral Health company with licensed clinicians throughout the United States. Stepstone Connect provides a wide-range of mental, emotional and behavioral-health services using secure, HIPAA-compliant technology. Stepstone Connect proudly works with America's First Responders through its growing professional network with police, fire and law-enforcement agencies at the federal, state and local level.